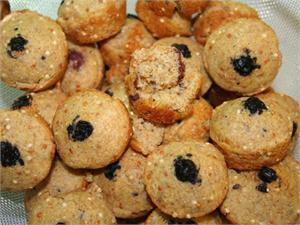 Berry Blast Birdie Bread is fun and flavorful and loaded with chunks of mixed berries and topped with a blueberry. You can add a little red palm oil, nuts, chopped veggies or fruits for added nutritional components to your bird's diet. Ingredients: Yellow corn meal, whole wheat flour, non fat milk, egg, baking powder, white millet, red millet, flax, applesauce, strawberry, blueberry, raspberry, blackberry.